Evgenia Villas & Suites is located in a quiet area of ​​Fira and offers stunning views of the island's east coast and rural surroundings. 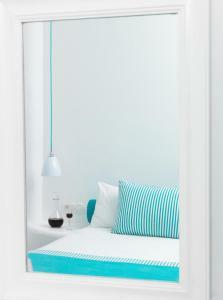 Room with typical Cycladic island decoration in earth tones, TV, fridge, air conditioning, hairdryer and free Wi-Fi. It opens onto a balcony with a pool and views of the village or the sea. This suite is decorated in a Cycladic style in earth tones with whitewashed walls and typical Santorini furniture. 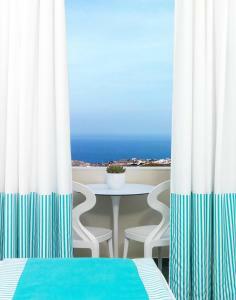 It has a balcony overlooking the pool, the sea or the town of Fira, free Wi-Fi, air conditioning and LED TV. 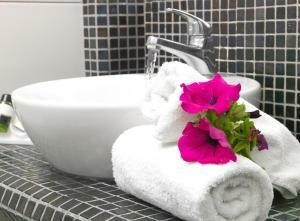 The private bathroom includes bathrobes, slippers and toiletries. This suite has a tile / marble floor, balcony and patio. Suite with balcony, private entrance and minibar.